| ORGANIZE MY DRAWER | Pantry & Kitchen Project — Minne Pristine & Co. I have had the pleasure of collaborating with Organize My Drawer for the month of August, using their custom drawer inserts! As a Professional Organizer, I come across many different sized drawers, so I love how I'm able to custom make each insert to fit the drawer space for my client's items. I can choose to use one of their many template offerings, or create a custom design from scratch. Another favorite feature of the design process of mine is making selections from the variety liners offered. Take an inside look at how I used their product in a two recent projects, a butler's pantry and a kitchen makeover! My client recently completed a home renovation and I had the pleasure to organize and style their beautifully renovated Butler's Pantry. Nothing like starting with a clean slate! My client loves to have family and friends over for get togethers, so it was very important to make this space fit their hosting lifestyle. During my consultation, we walked through their day to day use of this space and the direction they wanted their pantry items to flow. After planning where all the pantry items went, the next step was organizing each drawer and maximizing the space to it's full potential. I was able to do just that by creating the perfect fit organizers using Organize My Drawer. I took the drawer measurements near the coffee/tea station and created the drawer inserts using their user friendly website. The clear arcylic organizers give the drawers a nice clean look, as well as a reliable material to hold all the drawer items. I created sections in the top drawer for all the morning go-to's! A few rows designated for the Keurig cups and rows for the variety of tea. 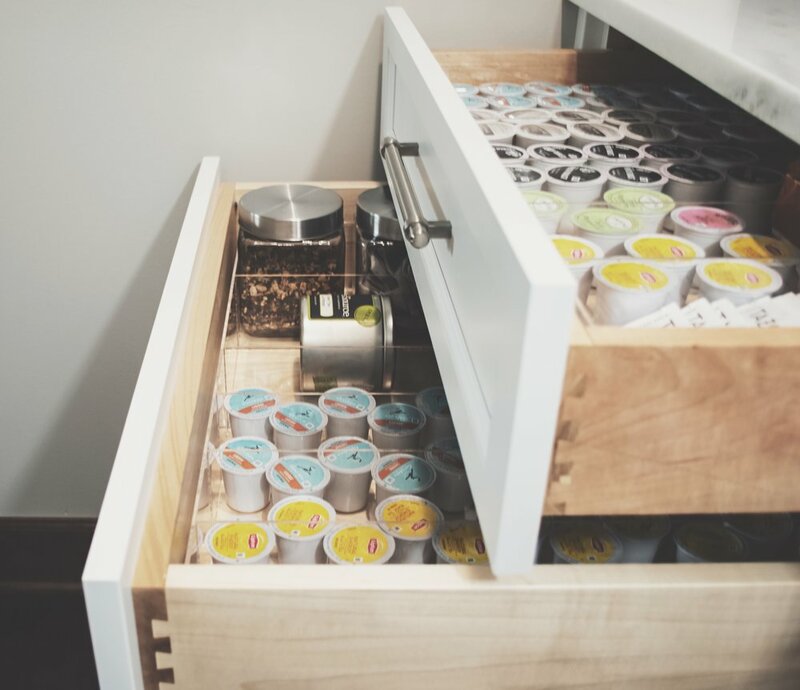 The second drawer was designated for additional storage, including all the back stock of coffee/tea and storage for the larger tins. The second project completed with the Organize My Drawer inserts was in my client's beautiful kitchen! The Organize My Drawer organizers were a great solution to maximize the drawer space in this apartment kitchen. For this project, I used the clear arcylic organizer for the silverware/bar utensil drawer. I love how the clear inserts give such a crisp look. The second drawer organizer was created to hold all the larger kitchen utensils, measuring cups and other miscellaneous items. I selected the Charcoal Foam Liner for the second drawer, making it easy to spot where all the utensils are. The final step was placing everything in their new homes. The organizers not only give a Pristine look to my client's kitchen, but more importantly help streamline their daily routines in this space. I hope you enjoyed the tour of my recent client organization projects! I highly recommend Organize My Drawer for your organizational needs. You can be sure see more of this product in other projects of mine!